A new scythe blade, as a rule, is not ready for any serious use without some preliminary attention to its edge. (The exceptions include the blades that we sell, and those from The Scythe Shop in England and the Austrian Sensenverein.) Thus instead of unwrapping a just-arrived blade, attaching it to the snath and heading out to mow, consider taking the few steps outlined below; they are likely to make that first mowing experience a more positive one. 1. Before mounting the blade, remove all lacquer and paint from at least 4-5 mm (3/16 inch) on both sides of the full length of the edge. Unless you use a chemical paint remover or have one of those small wire-brush wheels powered by an electric drill, this will be more than a two-minute job. A manual option involves first scraping off most of the lacquer with a cheap knife or the tip of a flat file. 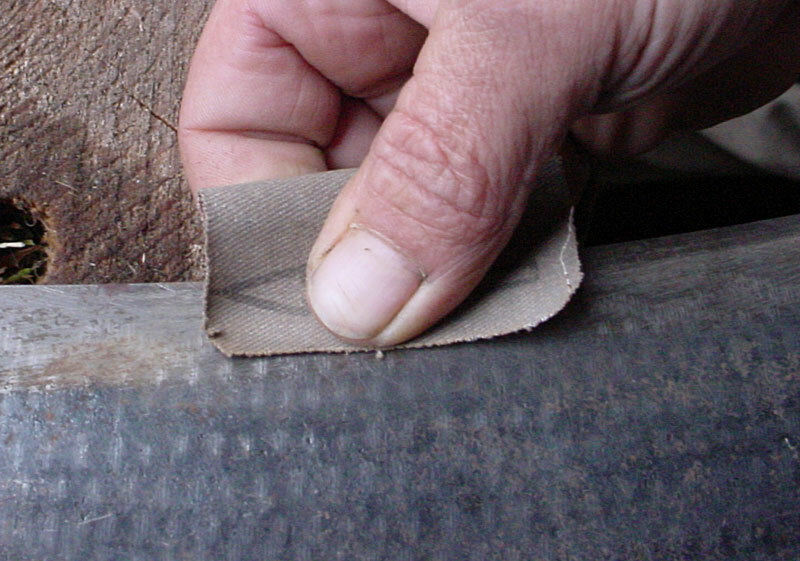 This will save on emery cloth or sandpaper, which would initially gum up very fast). Follow with emery cloth (preferably using two grits in succession). Start with a 60-100 grit and finish with maybe 180-220. Folding it over is safe and effective. 2. Inspect the edge closely and notice the tiny steep “secondary bevel” (below). If you wish to know why this bevel is there, read Note 1 (end of page). 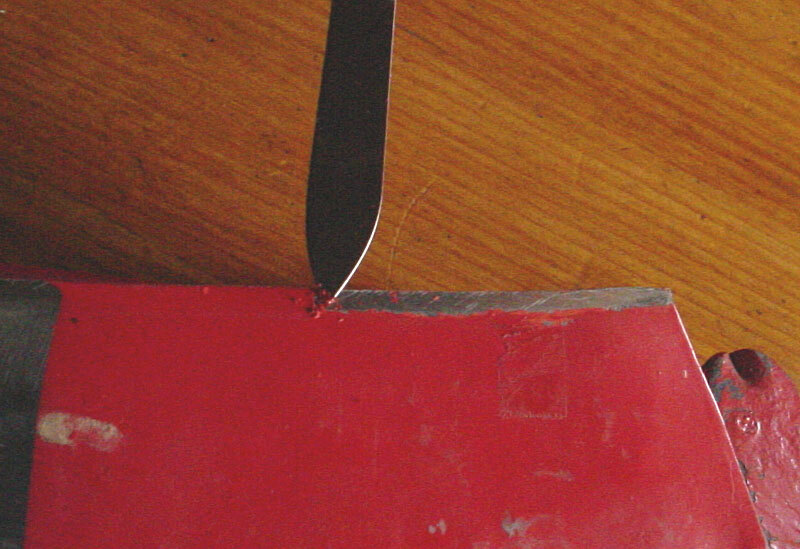 d. Freehand peening along the outermost 1-2 mm of the edge, with other words a 1-line or 11/2-line pattern of hammer strikes (explained elsewhere). My preference is option d; real beginners might do better with options a, b, or c, possibly in that order. 4. 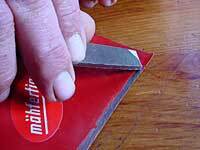 Hone the edge well using your field whetstone of choice. You will now be ready to mount the blade on the snath and have fun mowing! There was a time when some scythemakers finished the edges to perfection prior to sale, and the label “Mähfertig” (“ready to mow”) was born. About 20-30 years ago this step became cost-prohibitive, but the label often remained. Although the products from Austria today are pre-peened far better than is the case with scythe blades worldwide, not a handful of them are really “ready-to-mow”. When they come from under the mechanical peening hammer, they would be ready for the whetstone. But the last touch is a quick, light pass on a grinding wheel, which renders them dull again. Most will end up with a tiny secondary bevel either from the top or bottom, often both, which is not absolutely uniform. 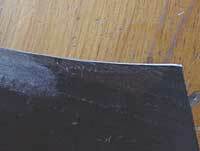 Until these bevels are removed, the edge will not react well to a stone, especially a fine grit and/or a natural one. Thus a mower’s first experience will, all too often, not be as encouraging as it could.